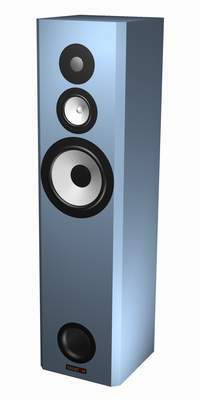 The Visaton Classic 200 is a large 3 way, bass reflex, floorstanding loudspeaker. "As expected the Classic 200 shows great attention to detail over the entire frequency range, reproducing nuances that other speakers just won't deliver. The listener never has the feeling that this openness is forced on him and that the speaker reproduces something that wasn't recorded. Since the bass is tuned relatively high for practical reasons, the sound is clean and clearly structured. The different sizes of tom-toms and drums can always be distinguished, bass runs are worked out clearly. Sure, there is also low bass but possibly not enough for low bass freaks. On the other hand, those who prefer precision will be delighted with this high set-up. The various noises - often found in classical recordings - like paging, noise from keys and wind instruments are projected in an easy and relaxed way. Big jumps in dynamics are produced almost without any compression, possibly giving the listener a shock treatment when listening to rock music or big orchestral works. This type of dynamics you wouldn't expect from such an unspectacular looking speaker. The catch to the extreme openness is that there is a slight boost in the upper midrange of certain recordings leading to vocals that are just a bit too much in the foreground. However, this drawback is more a matter of taste and is mainly noticeable when listening to unbalanced recordings. Those who have an echoing, little damped listening room and prefer the soft tones should rather test-listen the Classic 200 before buying. All others will have a loudspeaker that shows precision, openness and an excellent three-dimensionality. The Classic 200 is easy to built and the plain design is blending in with most furniture." In addition a terminal with gold plated brass binding posts, cable for internal wiring, screws, 3 bag (=6 mats) damping material, the Visaton bass reflex tube and the drivers.